One of the warmest additions to any household is a four-legged friend that provides unconditional love to the whole family! Love your furry friend? Don’t love the messes and pet odours they leave around your home? 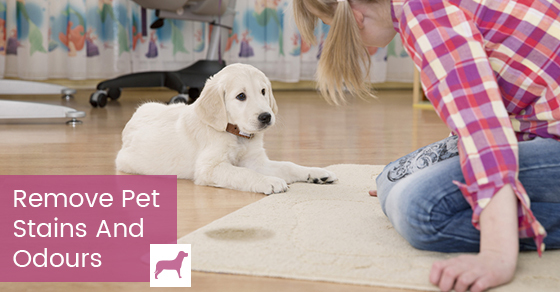 Here are some quick tips to help get your pet-friendly home guest-friendly as well! Clean up messes immediately! One of the best things you can do to save your carpets and upholstered areas is make sure any pet messes are handled when they are fresh. Use thick paper towel to soak up urine from the material or carpet. Get out all excess moisture and then rinse with clean and cool water. Next, blot dry with a clean towel or paper towel. Then, you will want to determine the cleaning product that suits the surface area best. Select a carpet or upholstery cleaner that is safe on your surface. It is always best to test a small amount on a small area to see if any discolouration or damage occurs. If you have access to a steam cleaner it is helpful to go over the area to prevent the stain and odour from setting in. Remove set in stains! If you come across an accident that has since dried and stained the surface area, a few additional steps should be taken to clean it thoroughly. Again, a steam cleaner is your best bet, as it uses a highly diluted cleansing solution to remove the stain with power and without harsh chemicals that leave a scent that may encourage pets to mark in the same area again. If the steam cleaner isn’t removing the stain, try spot cleaning with a pet odour neutralizer and then repeat the steam cleaning process. Washing Walls! Walls and baseboards that have been marked with urine can usually be wiped away with some cold water and elbow grease. You can use a heavily diluted vinegar and water solution, which can be sprayed on, sponged down, and wiped down again with clean water. Remember that leaving behind any scent may encourage animals to mark their territory again. If the area has been marked a fair bit, the wood may start to wear and may need replacement. Remember if repainting to use pet-friendly paint that will stand up to wash wear! Prevention is key! If you are a new pet owner, make sure to really train your cat to seek out the litter box and dog to do their business outside or on walks. Establishing routines and rewards early on sets good habits and prevents accidents. If your older pet is having new incidents, remember it may be acting out due to changes or a medical condition, so speak to your pet health care provider for more insight!